For several decades, breast implants were the only really viable mode of breast augmentation in the US. Fat grafting has gained popularity in the last decade, largely through the efforts and advancements made in breast reconstruction following mastectomy. Particularly in implant reconstruction, the use of fat transfer has added fullness, improved symmetry, and improved visible rippling known to occur with implant reconstruction alone. In Europe, fat transfer breast augmentation preceded the acceptance in the United States by about a decade. Plastic surgeons in the US were concerned about the possible implications of fat grafting to the breasts in regard to calcifications and interpretation of mammograms in regard to breast cancer detection and screening. Radiologists have confirmed that any calcifications caused by fat grafting can be distinguished from any calcifications associated with malignancy. Therefore, this triumph has overcome the concern that fat grafting could possibly lead to more biopsies secondary to mammographic calcifications. Dr. Hughes was voted one of the best breast doctors in Beverly Hills (Los Angeles). Dr. Hughes offers the full array of breast augmentation, revision, and lift procedures. Unlike other websites and advertising outlets, such as airline magazines and online ads, Cosmetic Town does not accept any sort of sponsorship for these listings. Breast fat transfer is a great tool to balance breasts, improve symmetry, and gain up to one cup size in volume. The fat transfer volumes to each breast may range from 240 cc to 360 cc in most cases. About 50% of the fat survives, on average. Some patients will require more than one session of fat grafting to achieve the best results. In most cases, Dr. Hughes transfers more fat than other surgeons to help avoid multiple procedures, higher costs, and multiple recoveries. In general, Dr. Hughes advises patients who want more than one cup size that breast augmentation with implants remains the most reliable method currently available. It is unreasonable to believe that fat grafting no matter how optimally performed can achieve more than 1 cup size. 3/4 cup size increase is about average for one fat transfer procedure. And though Dr. Hughes has performed up the 3 separate breast fat transfers in a few patients, Dr. Hughes believes that each subsequent surgery results in smaller improvements. Breast fat grafting has the decided advantage of utilizing your own tissue and avoiding all of the implant related complications including rupture and capsular contracture. In addition, fat grafting by its very nature requires fat to transfer and thus liposuction is performed to harvest the fat. Thus, the patient can get improvement in the breasts but in those areas of the body that are liposuctioned as well. 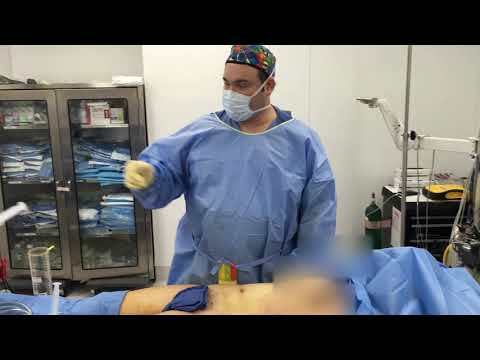 It is critical that the surgeon a patient selects is an expert in liposuction as well as breast augmentation. Dr. Hughes has performed countless revisions to fix liposuction deformities from surgeries performed by other surgeons performed elsewhere. The breast augmentation procedure with fat grafting should be a success as well as the liposuction. The liposuction should improve contours and also leave the areas liposuctioned smooth and as though no surgery was performed. The main complications of fat grafting to the breasts would include fat necrosis, wherein the fat injected can die and leave a hardened piece of tissue, which may need to be removed. Most of the time these areas will soften and improve without need for intervention. The fat grafting can cause calcifications, which may complicate mammogram interpretation (though probably insignificant). Finally, only 50% of the fat survives, and multiple operations may be necessary to obtain a stable, long term result. More recently, fat grafting has exploded in popularity primarily through buttock augmentation (Brazilian buttlift) and for facial volume enhancement. Dr. Hughes uses fat grafting techniques to augment calves, breasts, hips, traumatic defects, and previous liposuction defects. Please see some of Dr. Hughes breast fat grafting results in the breast fat grafting galleries. Breast fat transfer is a great tool to balance breasts, improve symmetry, and gain up to one cup size in volume.